This year has been a particularly busy one for me, since both of my kids have gone back to school after summer holidays and started slow, but steady preparations for various tests ahead. They have full-on schedules and by default, so do I. In addition to work schedules, I have to do school runs, piles of homework to supervise & extra work on top of it, as well as dropping off & picking my kids up from various after school activities. By the end of the day, when the kids go to sleep, I end up catching up on e-mails and working late into the night, leaving precious little time to attend to my own internal needs. Even beauty routines have to be quick and at times feel like they are done on the run, so what is one to do? When Dafna, founder of Dafna’s Skincare, got in touch, telling me about My Moments ritual that she has devised, my ears pricked up. 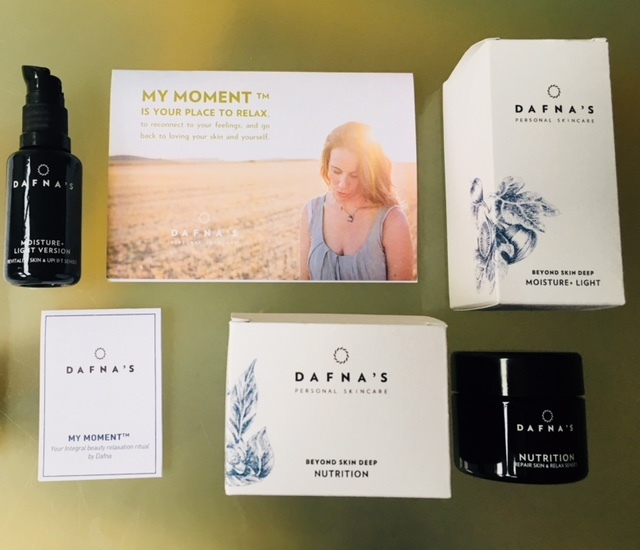 Dafna, as a mother of two, as well as a founder of a successful & growing brand Dafna’s Skincare, knows only to well the restrictions of time and the depletion we all experience at the end of the day. This spurred her to develop a beauty ritual that allows you to relax, while nurturing your skin. 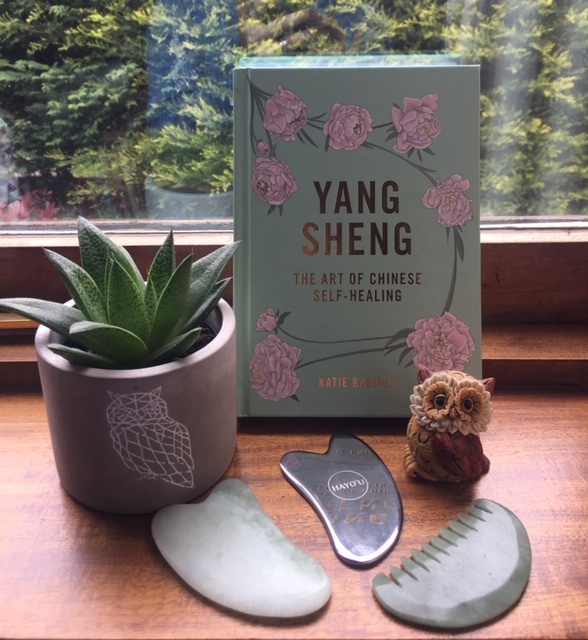 Combining Dafna’s skincare, the power of essential oils, modern ayurvedic holistic approach to wellbeing & traditional Chinese medicine, the four-step ritual takes minutes, yet manages to deliver lasting satisfaction. All YOU have to do is simply commit to a few minutes of ‘me-time’ at the beginning and end of your day. Step 1: Apply a small amount of cream to your fingertips. Inhale the scent of the cream. Take a few deep breaths & let your body relax & mind calm down. The olfaction sense is the first one we develop. It helps a newborn survive by knowing his mum’s milk is safe for him or her to drink & by helping form a bond between a baby & a mother. By taking the time to smell the cream or serum you use on your skin ( I alternate between Dafna’s ‘Moisture + Light version‘ & ‘Moisture +‘, depending on what my skin demands in the morning & switch to ‘Nutrition‘ in the evening. With the help of this quick ritual I end up feeling more energised, while in the evening calm descends on me, all simply because I take the time to breath deeper, letting my nose & mind decipher the fragrant ingredients of the skincare I apply to my face, neck & hands. Who knew that ‘Moisture +’, which combines extracts of Calendula & figs can lift the spirits, at the time when you might long to go back to bed, but have to run instead? It’s those unseen details that help us get on with our day with more vigour in our step. Step 2: Tap the cream with gentle movements from inside to the outside & from bottom to the top of your face. Why tap, you ask? Well, tapping your moisturiser into your skin will help it penetrate better & work more thoroughly on different skin layers, by increasing circulation. It will also help avoid leaving oily residue on the upper skin layer. Another little tip, is the direction of your moisturiser application. As we are all under the effect on gravity on planet Earth, tapping our moisturiser from inside outside & from bottom to top of our face will act against the power of gravity, which over time contributes to skin’s dullness & loss flexibility & suppleness. Step 3: Continue by massaging the cream in small circles & by applying a little pressure to the temples, between the eyebrows & behind the ears. Take the time to relax and enjoy the simplicity of just being in the moment with peacefulness and no external distraction. According to traditional Chinese medicine, our life energy should flow fluently. However, our energy flow is often disrupted by various factors, like anxiety, lack or bad quality of sleep & negative effects of stress. By applying small pressure to pulse points on our faces regularly can help release blockages & allow the skin to have more vitality, reduce negative impact of stress & promote general wellbeing. Step 4: Put your hands on top of your face, gently touching the skin. Take deep breaths, with long exhales, while keeping your eyes closed. Closing the eyes & inhaling deeply helps us concentrate & reconnect with ourselves. It also helps to focus on inhales & exhales, trying to lengthen them & taking them deeper into our tummies, helping shift stale air & toxins out of our bodies more effectively. Something we were so natural at doing when we were babies, without any intent or laser focus. Now many of us take very shallow breaths, instead of full ones, thus taking in less oxygen. Maybe if we consciously focus on inhaling the positive energy and exhaling all the negative vibes that we might have been accumulating or holding on to internally, it will help us feel more alert & content?! In many ways our own wellbeing depends on the steps we take to look after ourselves and an excuse that many of us make – ‘I don’t have the time’ – becomes quite lame, when we pause to consider the consequences of the lack of our own actions to safeguard our future. Dafna’s ritual, which has its roots in aromatherapy, yoga, meditation and mindfulness, allows you, when practised daily, to bring some meaningful moments that will nurture not just your skin, but your mind & your soul. Self love & self care, something that women who are mothers feel particularly guilty about, are in fact the tools that allow us to nurture others. After all, you can’t pour from an empty vessel & when you have a few moments of peace in the calming space that is your bathroom, it allows you to be more grounded in your intentions & more at peace with yourself. It will also empower you & make you more productive, when combining personal & professional schedules. And for those days when I feel too tired to nurture myself with intention, there are always little hands that start giving me a massage, as I lie down on the floor, listening to my children reading out loud. They help to form precious moments the power and meaning of which in my life is never underestimated or taken for granted. The future is unpredictable, so take the time to savour every minute of every day, no matter what you do or what life throws at you. Rituals & gratitude create a powerful armour that we all need in the battlefield of life.